Basketball registration forms are documents which are to be used by sports organizations, educational institutions, and even business companies for gathering the information of individuals who plan to participate in a basketball game or tournament. By having a basketball registration form, coaches and sports analysts will be able to identify who among the registrants or the participants are suitable to be part of the final list of players for the game, and who will need to undergo further training in order to meet the standards and needs of the organization. Moreover, basketball registration forms which are made using word-processors or word-processing software applications and programs are also known as basketball registration forms in word or “.DOC” format. This format is the most commonly used format among other document file formats in the web such as “.PDF” and “.XLS”. One known benefit of choosing this format is that it allows the user of the form to change the contents as well as input passwords for protecting the document from being altered by other end-users when the form is being opened. Step 1: Open the software application and prepare the document. The type of word-processing software application to be used for making the form will depend on the preference of the one making the registration form, and the availability of the software. The document-maker can choose from online programs such as the Google Docs, or offline such as the Microsoft Word and Apple Inc. Pages. Nonetheless, the document-maker should use the word-processing software application or program that he is familiar with so that he can navigate throughout the entirety of the program with less supervision from other parties. Also, in preparing the document, the margins and other measurements to be altered based on the organization’s layout preferences should be specified before beginning to incorporate any content for making the form. Step 2: Place the name of the organization and the title of the form at the topmost portion of the document sheet. There are word-processing software applications and programs that contain headers wherein the document-maker can customize the header’s content with relevant information such as the organization’s name and the document’s title. On the other hand, clicking beyond the top-margin can also make a header in some software applications and programs. Along with the name of the organization and the title of the form, an area or a line for indicating the date when the form is to be used can be beneficial for documentation purposes. Step 3: List the guidelines and instructions. Although registration forms are just basic documents, it is still more effective to provide instructions and guidelines to the end-users of the form in order to have an assurance that they will be providing sufficient data in the form. Aside from the instructions of how the user can complete the form, the steps and the procedures to be taken after submitting the completed basketball registration form should also be indicated along with the fees to be paid especially if the registration form is for a basketball camp or training program where the participants will have to provide payments for their jerseys and the trainers or the coaches. In addition, the contact information of the staff or the organization should be included as well. This is for allowing the registrants in knowing how they can reach out to the organization to raise concerns, issues, and inquiries about the activity. Step 4: Add a player information section. The name of the player or the registrant should be the first data to be disclosed in the player information section. This will then be followed by entry fields for collecting other details of the registrant such as his gender, address, the names of his parent and legal guardian, his date of birth, the current educational level that he is in, his and his parent’s contact numbers, and his shirt size for the basketball jersey. Step 5: Include a medical information and authorization section. The purpose of incorporating a medical information and authorization section in a basketball registration form is to document the medical and health background of the registrant. This section should be able to gather the name of the registrant’s emergency contact person, the name and address of the registrant’s physician or doctor who has administered medical examinations and has known the registrant’s health condition, and the health insurance details of the registrant. Additionally, in this section, there should also be an area for listing the health issues of the registrant along with its description or explanation to properly inform the organization. Step 6: State a waiver of liability agreement. Documenting the approval or the consent of the registrant and his parent will be the purpose of a waiver of liability agreement statement. Below the statement, a signature block must be incorporated for the signatures of the registrant and his parent, and the date when they filled out and signed the basketball registration form. The signature block can simply be made of underlines or lines for each party involved, and the labels underneath each line. Step 7: Save the form. Before saving the form, the contents and the layout must first be reviewed and be checked to determine if there are other pieces of information needed to be included in the form. And when saving the form, the file format or the extension must be in “.DOC” for it to retain its format in word. 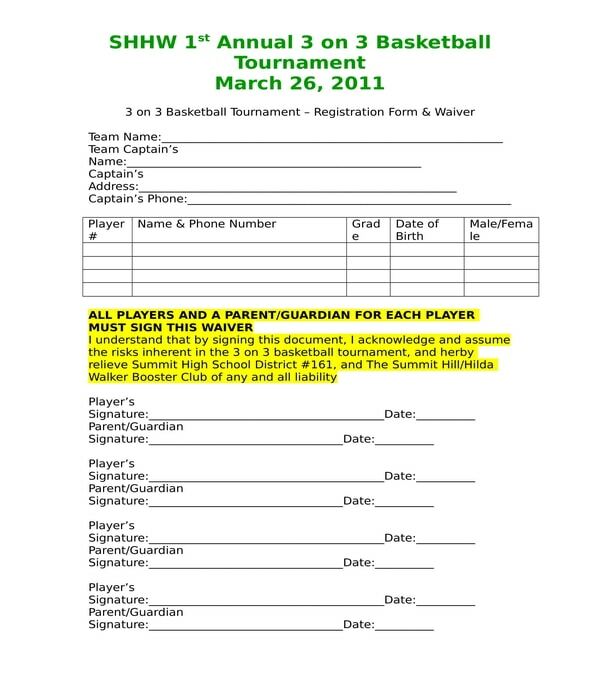 Annual Basketball Tournament Registration Waiver Form – Organizations who will be conducting annual basketball tournaments will be using this variety of basketball registration form in word format. The form will collect the name of the team who will be participating in the games along with the name of the team captain, the address of the team captain, and the phone number of the team captain. In addition, a table is also incorporated into the form which is allotted for the list of the players of the team with their individual player numbers, phone numbers, grade levels, dates of their births, and their genders. For the safety and the security, as well as to ensure that the organization will not be held liable for any injury that the players will acquire during the games, a legal guardian or parent waiver statement is also indicated in the form. Below the waiver statement, the signatures of each player and their legal guardians will have to be affixed with the date when they signed the registration form. Moreover, there is also a section which is intended for the team’s volunteer. This particular section of the form will collect the name of the volunteer along with his phone number, and his electronic mailing address. 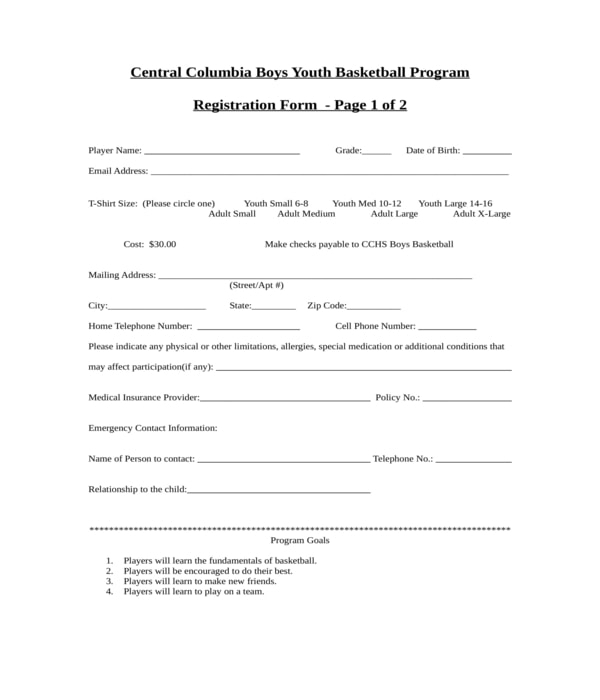 Basketball Club Registration Form – This variety of basketball registration form in word format should be used by educational institutions who will be opening a basketball club for basketball enthusiasts. In a basketball club registration form, the registrant or the student in the institution who plans to join the club will have to provide his name and his identification number as well as his title, telephone number, email address, and his date of birth in the first section. Other pieces of information to include in the basketball club registration form would be the population group or category of the registrant with regards to his race, the school that he had attended, and the course that he is studying in. Additionally, the registrant must also disclose the details of his athletic affiliations and the courses that he took which are related to athletics, and an indication of whether he is an athletic scholar or not. To complete the form, the student will need to supply his signature in the allotted signature line with the date when he signed the form, and his registration or student receipt number. 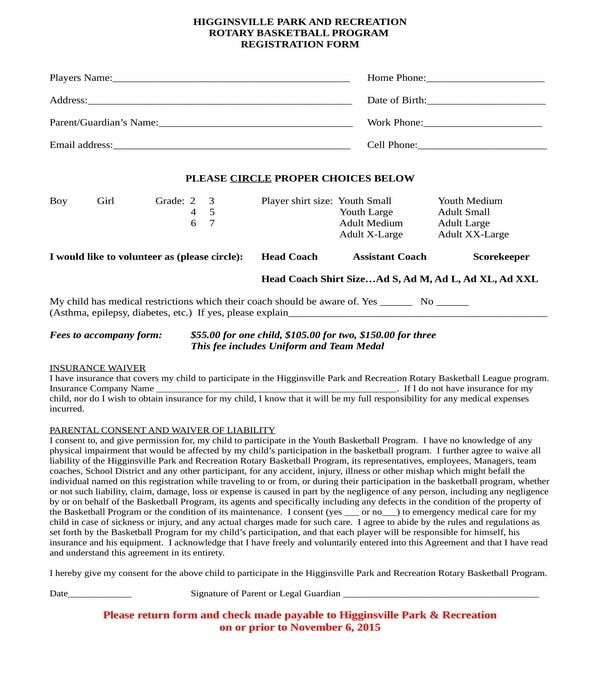 Basketball Program Registration Form – There are parks and recreational event organizers who offer sports programs to their clients and their target audience. For this, a basketball program registration form must be prepared in order to gather the data of their registrants. In this form, the registrant will be referred to as the player wherein he must state his name, address, home phone number, date of birth, the name of his parent, and his email address. The shirt size of the player will also have to be indicated in the form along with his gender, grade level, and whether he wants to volunteer as a coach, an assistant coach, or a scorekeeper during the basketball game or the program sessions. If the registrant has any medical restrictions, then he must disclose his medical needs and limitations in the form as well to inform the program organizers regarding his medical background. Moreover, the fees to be paid by the registrant is also stated in the registration form along with an insurance waiver, a parental consent, and a waiver of liability statement. These will have to be acknowledged and be approved by the legal guardian of the registrant. To document the approval, the signature of the legal guardian will be needed in the form. 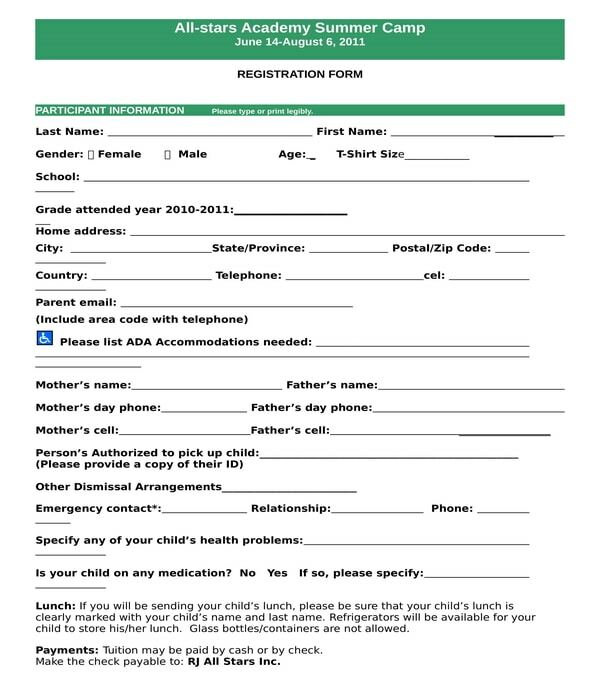 Basketball Summer Camp Registration Form – Summer camps are programs which are conducted during the months of summer. If it is a basketball or a sports summer camp program to be organized, a basketball summer camp registration form should be created by the event organizer. The form is comprised of four sections which are needed to be filled out by the registrant and his parent or his legal guardian. The first section will collect the personal information of the registrant which includes the details of his parents and their contact information for emergency and authorization purposes. On the other hand, the second section is allotted for the health information of the registrant or the participant of the summer camp. This will be where the registrant can disclose any health issues that he is currently dealing with, as well as previous health conditions which can be triggered during the intensity and movements in the game. Additionally, all the relevant information about the basketball summer camp will be enlisted and be defined in the third section of the form. This will state the camp and registration fees, the contact information of the camp organizers, and the drop-off and pickup time to be noted by the parents of the campers or the participants. Lastly, a medical treatment consent and a parent statement must be signed by the parents of the registrant in order to complete the registration form. 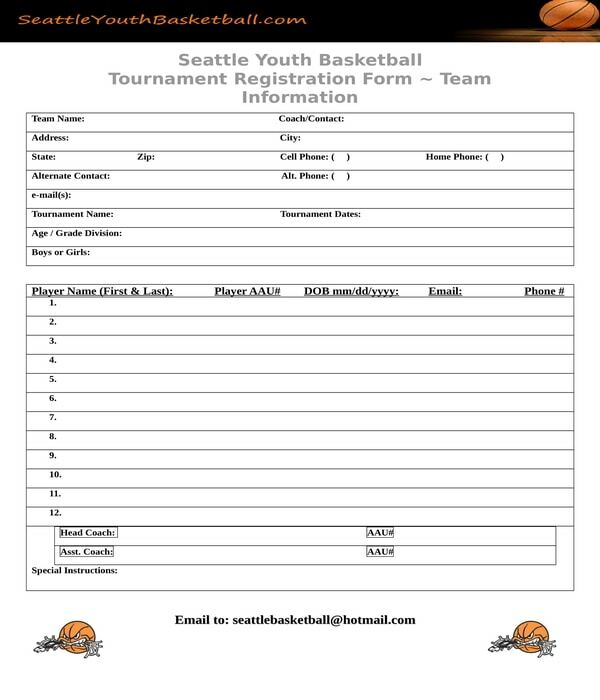 Basketball Tournament Team Registration Form – Compared to the aforementioned forms, a basketball tournament team registration form focuses on enlisting the team members and in identifying the head coach of the team. The form contains two sections wherein the first section is intended for disclosing the team name, the name of the coach and his contact details, the name, and date of the tournament, and the age or division category of the team members. The second section of the form is allotted for the list of the players which should have their player identification numbers, dates of births, electronic mailing addresses, and their individual phone numbers. The identification numbers of the head coach and the assistant coach of the team will also be stated in this section of the form with the special instructions that they would like to inform to the tournament organizers regarding the team’s needs and concerns in lieu of the basketball games. 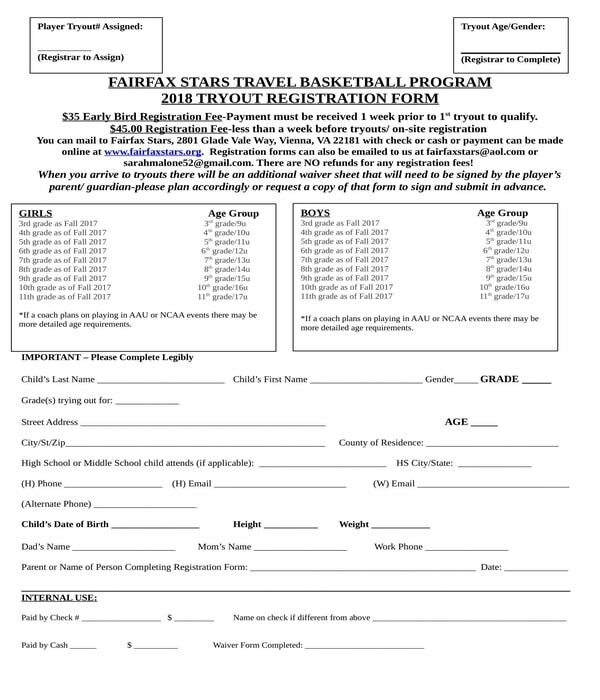 Basketball Tryout Registration Form – Basketball tryouts serve as the selection phase of searching for the players who will be completing the coach’s basketball team. For this, a basketball tryout registration form will have to be used for each player. On the topmost left corner of the form, the tryout number of the player will be indicated, while on the opposite corner will be for the age and gender of the player. A section intended for determining the age group of the player along with his gender category is also included in the form to ensure that the staff who is accepting the registration forms from the players can identify and assign the payers immediately to their categories. The information to be disclosed by the registrant or the registering player will include his name, gender, the grade that he is trying out for, his address, and his country of residence. In addition, the weight and the height of the registrant will also have to be stated in the form along with the names of his parent, their personal and work contact numbers, and the name of the person who is completing the registration form if the registrant is not the one who is filling out the required entries. Lastly, an internal use section will have to be completed by the staff assigned for the tryout registration. This section will document the amount paid by the registrant in check and in cash, and whether or not a waiver has been signed by the person providing the payment for the registration. 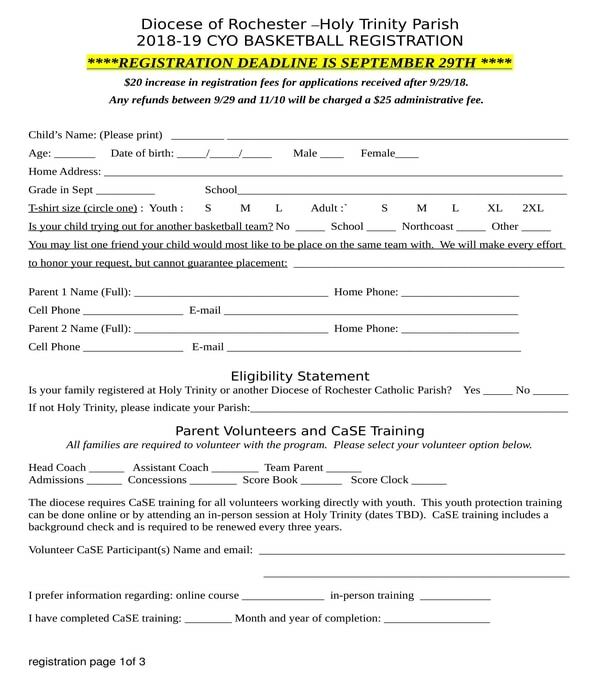 Church Basketball Registration Form – Churches and religious groups also conduct sports events and activities for their members especially during family day celebrations and outdoor worship events. This is why it is essential to prepare registration forms for each game to be held such as a church basketball registration form for the men’s and women’s basketball tournaments. In a church basketball registration form, the general information of the participating member will be the first details to be stated which will then be followed by the shirt size preference to be used by the member during the basketball game. There is also an area in the form wherein the registrant or the member can refer another party who can be a player for the game, along with a section intended for determining the eligibility of the registrant to participate in the tournament. And for parents who would want to volunteer as tournament staff members, they must sign the parent volunteer agreement in the form which is for indicating their interests in providing free service to the organization. 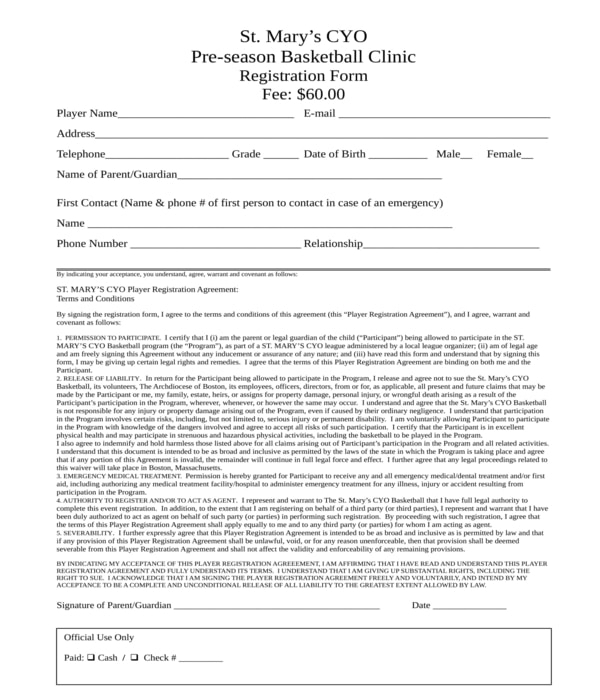 Pre-season Basketball Clinic Registration Form – Pre-season basketball programs are intended for individuals who want to improve their basketball skills and abilities before the official basketball season begins. This allows players to be prepared, and coaches to choose their bets of who will be the members of their teams. With this, a pre-season basketball clinic registration form will have to be filled out by the interested basketball player. The form will only collect the basic information of the registrants such as their names, addresses, and the phone numbers of their parents. A list of terms and conditions to be agreed by the parent of the registrant is also included in the form along with the payment method chosen by the parent for the basketball clinic fees. 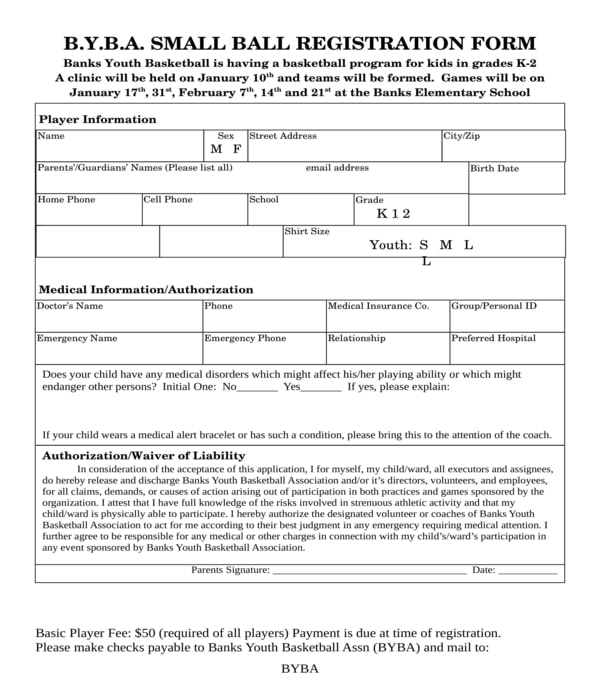 Youth Basketball Registration Form – This variety of basketball registration form will gather the basic data of the registrant just like all the other registration forms, however, it contains an additional section for laying down the goals of the program for the registrant. There is also a section for the parental waiver and release of all claims and assumption of risk statements which are intended to informing the player or the registrant and his legal guardian about the hold-harmless intent of the organization conducting the youth basketball program. 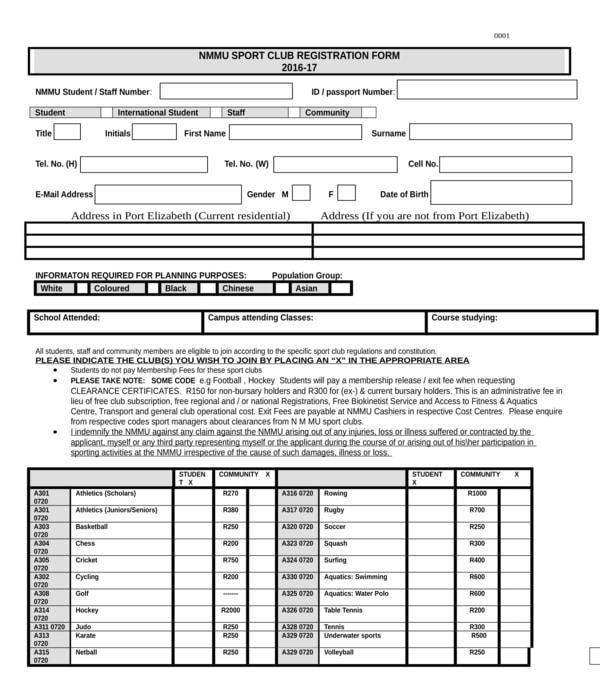 What Other Forms Can Be Enclosed With a Basketball Registration Form in Word? Basketball is a sport which includes a lot of intense physical contact within the involved players which is why it is important to require the parents of the participants or the registrants to sign a waiver release agreement form along with the registration form. The purpose of a waiver release agreement is to protect the organizers of the game from any liabilities if ever the player gets into an accident throughout the duration of the game. Also, the release agreement will document the approval of the parents and the registrants to waive their rights in filing a lawsuit to the organizers in lieu of the accidents and the injuries obtained by the player. Another document to attach to the basketball registration form in word format is a media release agreement form. This is an essential document to be signed by the registrant and his legal guardian especially if the organizers of the basketball tournament or games aim to take photos and videos to promote the event. Without a media release agreement, the organizers will not be able to use images and videos wherein the player can be seen. Lastly, a medical history form should also be filled out by registrants and their legal guardians. Basically, a medical history form is to inform the organization about the medical and health condition of the registrant who will be playing in the tournament. The history of the registrant will allow the organization in selecting players who can sustain themselves throughout the game with less or no medical supervision, unless if the basketball game is intended for persons with disabilities or those with wheelchairs. Regardless of the variation of basketball registration forms which will be used by sports teams and organizations, the objective of using the form must be retained: to collect relevant details of the registrant. And, the form must also inform the registrant about what he is participating in and what he will be liable including his financial responsibilities and to take care of himself when playing in the court. Recognizing these liabilities will help the registrants or participants in acknowledging and accepting their roles when they hit the basketball court, and they will also be accountable for their movements and actions towards their team and their opponents.